We encourage members to take part in the BRC affiliated team events that take place throughout the year. There is a great variety of competitions at different levels across the disciplines. We also welcome any non-riding team members who just want to join in, cheer us on and partake in the team spirit at events. Being part of British Riding Clubs opens up a who raft of competition opportunities for members. Competitions start at local, (area level) and progress to national and even international levels. Competitions are run at some of the biggest equestrian venues and events in the UK, including Olympia, Royal Windsor and The Royal International Horse Show. The majority of BRC competitions are based on teams, although some allow individual entries as well. HCTG has always been a strong supporter of BRC competitions and is proud of its successful competition record at both area and national level. The Club has always been very active in putting teams forward for BRC competitions. There is a wide variety of competitions with a calendar of events running throughout the year. Competitions cover both dressage and jumping disciplines and you can get more details about these from the BRC Rulebook and Area 4 web site. There are also other competitions open to BRC teams that run throughout the year such as the Blenheim Eventers Challenge (Arena Show Cross), the Yorkshire Equestrian Team Challenge (Show Jumping) held at the Great Yorkshire Show ground and British Dressage Team Quest competitions. As Harewood is an adult club you have to be 18 years of age on 1st January to be able to compete in senior team competitions. Entries have to be submitted a number of weeks in advance of competitions so we need to know well in advance how many members are interested in competing. There are restrictions on the number of entries the Area can take and we can often have more members wanting to take part than we can accommodate. Selection for team places is based on form, performance at training and competitions and availability to compete at the National Championships should we qualify. However, the members helping record will also be considered in the selection process. You can register to help at a club event on the Volunteering Page. Whilst Harewood is a competitive Club and has been well represented at National Championships, we are also keen to encourage anyone who would like to represent the club to come up through the ranks and have the opportunity of Show jumping in the International arena at Bishop Burton, competing in a dressage test in front of an affiliated BD judge or taking part in a horse trial for the very first time. So, if you are keen to have a go but not keen on the idea of competitive pressure we will happily enter a team of like-minded people who want to experience the Harewood team spirit. As competitions approach new information on entries and training will be posted on the site and on Facebook. This will also tell you when you need to register your interested by and the cost of the entry. Training sessions are organised for specific competitions during the year but please take advantage of the regular club training, competitions and our Spring camp for ongoing training opportunities. For upcoming training events please go to the diary and our Facebook page. For anything you want to know about teams Amy Pickard will be pleased to fill you in. There is strict eligibility criteria for both horse and rider and to ensure we don’t unwittingly fall foul of any rules it is important you understand which BRC competitions you are eligible for. Eligibility can vary depending on discipline and can be different to other affiliated competitions so it is important to check the official Rule Book. 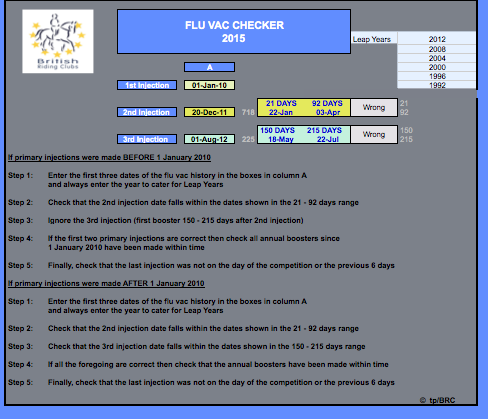 To compete in any BRC competition your horse must have a valid flu vaccination record. The record will be checked at every competition and you will not be allowed to compete if there is any discrepancy at all. It is your responsibility to ensure that your horse’s flu record is compliant and you can check this in the ‘Useful Infomation’ boxes on the right of this page. You will also have your hat and body protector (where required) checked at each competition. You can also see the required standards for these in ‘Useful Information’ . Tell us about you and your horse and what teams you want to be part of. You can see the Body Protector Standards here. You can check if your horse’s flu certificate is compliant with the regulations by using the quick and easy flu vac checker. To use the checker you will need to have Excel loaded on your device.